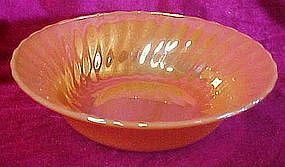 Peach Lustre Shell pattern, round vegetable bowl measures 8.5" in diameter,c.1960s. Anchor Hocking/Fire King, dinnerware on the bottom of the bowl. Excellent condition and shiny bright coloring. I have 4 available, and price is for each. Color is not as shiny on two. First choice is best!